It appears many times in geometry, art, architecture and other areas. then you will have the golden ratio. 6/4 = 1.5, but 10/6 = 1.666..., closer but not there yet! 6.18/3.82 = 1.6178..., and 10/6.18 = 1.6181..., getting very close! The digits just keep on going, with no pattern. In fact the Golden Ratio is known to be an Irrational Number, and I will tell you more about it later. It is getting closer and closer! But it would take a long time to get there, however there are better ways and it can be calculated to thousands of decimal places quite quickly. Then you can extend the square to be a rectangle with the Golden Ratio. The square root of 5 is approximately 2.236068, so The Golden Ratio is approximately (1+2.236068)/2 = 3.236068/2 = 1.618034. This is an easy way to calculate it when you need it. 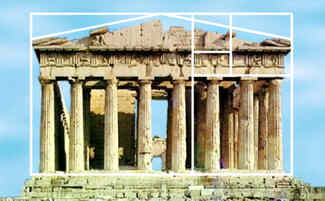 Many artists and architects believe the Golden Ratio makes the most pleasing and beautiful shape. This rectangle has been made using the Golden Ratio, Looks like a typical frame for a painting, doesn't it? such as the Parthenon in Greece. And here is a surprise. If you take any two successive Fibonacci Numbers, their ratio is very close to the Golden Ratio. In fact, the bigger the pair of Fibonacci Numbers, the closer the approximation. So, it neatly slips in between simple fractions. The Golden Ratio is also sometimes called the golden section, golden mean, golden number, divine proportion, divine section and golden proportion.